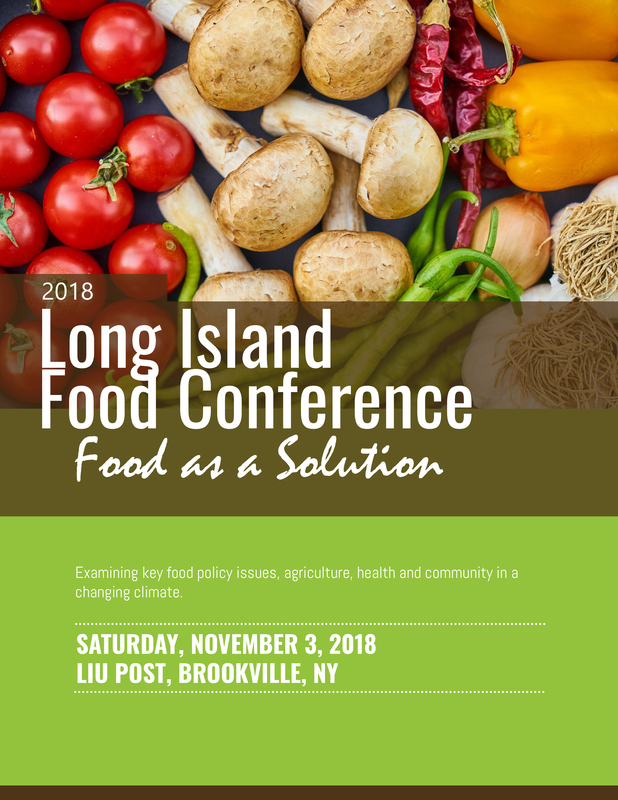 On November 3, 2018, LIU Post, Cornell Cooperative Extension, iEat Green, Long Island Cares, Sierra Club, North Shore Land Alliance and others, under the umbrella of the Long Island Food Coalition, hosted a full-day conference titled Food as a Solution. This event brought together a variety of community members and organizations around key topics in food, policy, agriculture and health in a changing climate. Three hundred attendees including students, teachers, farmers, foodies, scientists, policymakers, business owners and volunteers awoke early to hear keynote speaker Frances Moore Lappe, wildly celebrated author and co-founder of the Small Planet Institute, kick off the conference. Frances, who has dedicated her professional life and writing to enabling people to make a difference in their own lives, spoke about the power of democracy as well as the impact that industrialized agriculture has on humans, natural resources and the environment. Divided into four panels, special guests and speakers addressed the current challenges and solutions for planetary sustainability and local foodshed models; including state and federal food policies that increase healthy food access; building soil health; preserving water quality and reducing one’s own carbon footprint. Top Chef Tom Colicchio asked everyone to vote for appropriate policies and the leaders necessary to catalyze the change we need to shape the future of our food system. Feedback founder Tristram Stuart illustrated the story of food waste, enlightening all our audience participants that a third of global waste is food scraps. Dr. Robert Graham, founder of FRESH Med, an integrative health and wellness center, and Sally Fallon Morrell, President of the Westin A. Price Foundation, discussed the benefits of vegetables versus nutrient-dense foods like meat, butter and eggs. Ellen Kamhi, the Natural Nurse, invited us into our backyards to forage for a variety of edible, nutritious plants. While different diets work better for different people, they all agreed that fresh, locally sourced foods are the best solution. The day wrapped up with Michael Doall (marine biologist ), Fred Lee (farmer and owner of Sang Lee Farms), Frances Whittelsey (journalist and Gateway Community Garden organizer) and Stefan Oberman (manager at high tech vertical farming AeroFarms) who explored a variety of ways to grow food from small community gardens to large organic farms and from industrial warehouses with grow lights to ocean farming. It was a wonderful day and we hope everyone who attended went home with a better understanding of the state of food on Long Island and a desire to try at least one new thing to improve personal health and that of our community. For more information about the Long Island Food Coalition or the 2018 Long Island Food Conference, please visit www.lifc.org. Here are a few images and the event program from the 2018 Long Island Food Conference: Food as a Solution. Kristen H., Megan L., Roxi S.